As you age, you’re at an increased risk of suffering from a herniated disc near Miami, particularly if you play sports. Athletes are more likely to develop disc herniation, degenerative disc disease, and lower back pain due to the nature of their regular physical activity. What Are the Most Common Causes of Herniated Discs? A herniated disc can be a painful condition that may require a herniated disc surgery such as a discectomy combined with a laminectomy. 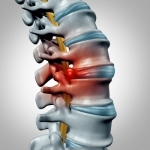 In addition to back pain, a herniated disc can result in pain that extends along the limbs. Numbness, tingling, and weakness may accompany the pain.